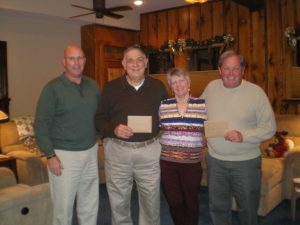 A dinner was held recently to honor these two organizations and to present the donations. The event was held at the newly-renovated 1885 Central Hose Reel House. An appropriate location for the presentation, this building was the first of three South Water Street homes of the FFD serving as our headquarters from 1886 to 1924 until we moved next door in 1925. This building later served as homes for both the Frostburg Police Department and the City’s tax office and until the mid-1970s when it became the home of the FAAS until the mid-1990s. Today, it is the residence of Barb and Slug Armstrong. Thank you to The Armstrong Insurance Agency, founded in 1954 by Ruth and Jack Armstrong, who continuously strives to serve the community. From L to R: Dave Llewellyn, Armstrong Insurance; Gary Tummino, Frostburg Fire Department; Barb Armstrong, Armstrong Insurance; Jim Koon, Frostburg Area Ambulance Service.